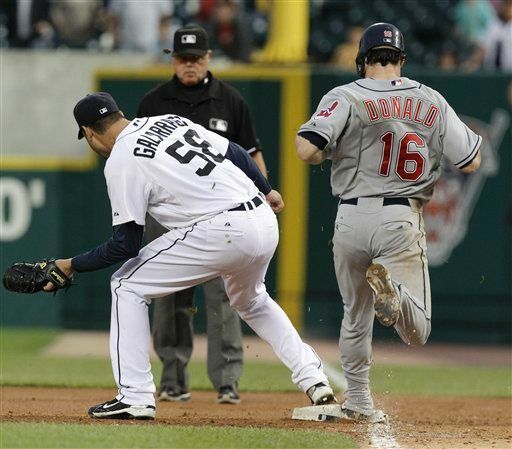 Yes, Detroit Tiger RHP Armando Galarraga pitched a perfect game. Yes, his performance deserves to go down in history next to the 20 other such outings in the 134-year history of Major League Baseball. But here's the problem if Umpire Jim Joyce's brain-dead call were overturned: it would take apart the very fabric of baseball. And I'm not talking about "the human element," that umpires represent. I could care less if the umps existed or not, or if every call was dictated by video. I don't care how long baseball games take (though you could see that this one was 1:44). What I do care about is the integrity of the scorecard. Unlike any other sport, each at-bat is framed for posterity inside the scorekeeper's grid - whether that scorecard is filled out by the official scorer, a writer in the press box, a broadcaster, or a 7-year old kid in the stands. When you look at the box score, Indians' leadoff batter Trevor Crowe was 0-for-4. That means that 28 batters took a turn at-bat, not 27. 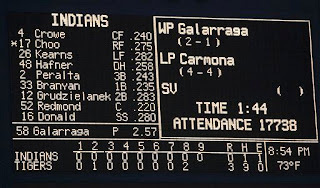 If Galarraga were awarded a perfect game, how could you explain the extra batter? It's like a player going from first base to third base with no explanation. Baseball is linear. Each event affects the next. Period. Now could the hit be turned into an error, and the no-hitter still stand? Yes, that's possible. Except Joyce thought the runner beat the throw, he wasn't swayed by the snow cone catch Galarraga made covering first. So no to that too. If we could fix all the fallacies that affect history, then Al Gore would have won the 2000 Presidential election, and who knows what would have happened from there. Now Gore is getting divorced, and as a clever friend of mine posted on Facebook, "Who gets custody of the internet?" Each event affects the next. What may get lost in the history of Wednesday night's events is the catch made by Tigers CF Austin Jackson (former Yankee prospect), which may well have gone down as one of the greatest in history. But on the scorecard, it's just an F8. 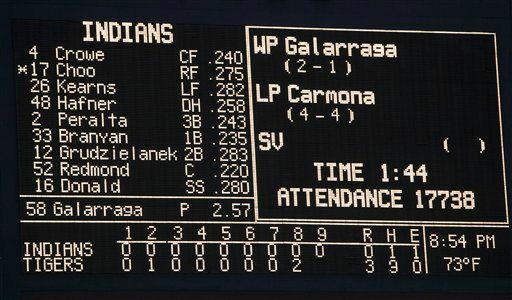 The first out of the 9th inning of a Complete Game, 1-hit shutout on June 2nd, 2010 in front of 17,738 in Detroit.